Greek Prime Minister Alexis Tsipras said the country had good reason to expect better days ahead after formally exiting its last financial bailout, putting an epilogue to a dramatic nine-year debt crisis. “Today a new day is dawning in our country, a historic day. The bailouts of recession, austerrity, recession and social desertification are finally over,” Tsipras said in a televised address to the nation from the island of Ithaca. “Our country regains its right to shape its own future,” he said from a hill overlooking a bay in the island where Odysseus returned after a 10-year voyage recounted by classical poet Homer. 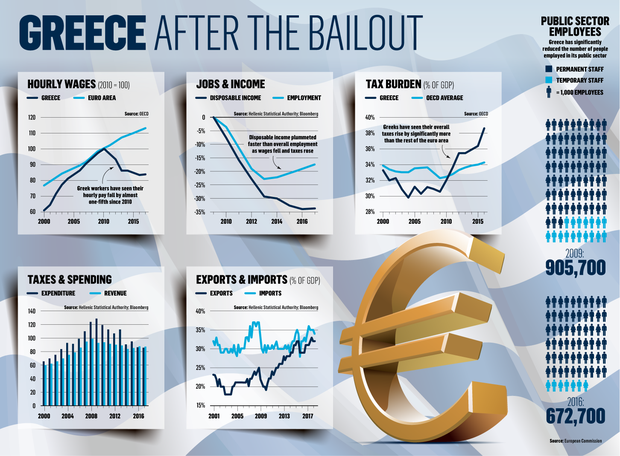 Greece has exited its bailout – a symbolic move past the debt crisis that exploded eight years ago and transformed the country’s economy and the lives of its people. At the time of the May 2010 aid package – the first of three – politicians from euro-area creditor countries argued the crisis was the result of chronic fiscal and economic indiscipline. To justify breaching a “no bailout clause”, loans were tied to strict conditions covering everything from government spending to public administration and justice. While Greece’s crash rippled far beyond the borders of the country of 11 million people, the effect at home was particularly dramatic. Economic output fell by a quarter and living standards collapsed after the loss of more than a million jobs pushed unemployment at one point to 28pc. For the country’s creditors, this was the cost of putting economic growth on a sustainable footing. “The ultimate goal of the financial assistance plan and reforms in Greece over the past eight years has been to create a new basis for healthy and sustainable growth,” Portuguese Finance Minister Mario Centeno, who chairs meetings of his euro-area counterparts, said yesterday. The Greek leg of the global financial crisis was sparked when George Papandreou’s newly-elected government revealed that the country had misled the world about its finances and the 2009 budget deficit had swelled to more than 15pc of gross domestic product, five times the EU limit. In recent years, the debate on Greek finances has turned more to the amount of public debt and the fiscal balance excluding the costs of servicing that debt. That’s meant less attention on the fact that, for two years now, revenue has exceeded spending and the government has run an overall surplus. This has been achieved by slashing spending while holding revenue more or less unchanged. But maintaining steady revenue meant a huge squeeze on middle-class Greeks, who’ve had to stump up more and more in taxes. On the spending side, Greece’s fiscal problems were partly caused by an explosion of public-sector jobs in the years before the crash. Greece shrunk the public payroll by 150,000 jobs by only hiring one person for every five departures and not renewing temporary contracts. Still, progress has been slow in improving the speed of resolving civil disputes in the justice system, and the burden of red tape has made it harder to attract investment. Over the last eight years, a constant refrain from euro-area nations and the IMF was that Greece needs more structural reforms to make it more competitive. Over three bailouts, it’s sold state assets, made sweeping changes to the electricity market, and changed regulations. There was also a big fall in labour costs, particularly after reforms to collective bargaining rules and a cut in the minimum wage in 2012. Along with rising taxes and the loss of jobs, the hit to wages was a major contributor to the drop in Greek living standards. Prime Minister Alexis Tsipras wants to roll back some of the labour reforms after the bailout, including increasing the minimum wage.